Trees are living and breathing organisms and, just like us, they sometimes need a health care professional. Because it might be a tall order to pluck them up and take them to the doctor, you should really call the doctors who will do a home visit right in Staunton, Virginia. Tree health doesn’t always seem that complicated, but it really can be. There is so much that can go wrong that you might not be able to spot if you haven’t studied tree health. 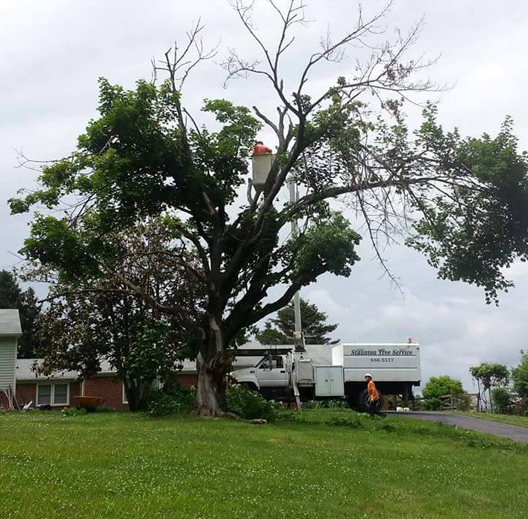 At Staunton Tree Service, we have the knowledge and experience to be able to spot problems almost immediately. If you are interested in getting a checkup for your tree, we will work with you to create a maintenance plan for any problems that we do find. Call us and we will be happy to give you peace of mind about the health of your trees. Use the form below to request a free estimate on your Tree Health Care needs in the Staunton, VA area. Tree health care is vital for trees at any time of the year, because it keeps them healthy and safe for you. We look over your trees from the top to the bottom and back up again, looking for anything that could go wrong. If we find something, we talk to you about how to treat it and get your tree back to normal. Trust us when we tell you that it is worth it to get your trees checked out at least once – and we can work on it from there. For the most part, a tree health care plan is put into place so that you can avoid larger costs down the line. When pricing for your yard, we will look into the size and scope of your yard – how many trees do you have? How big are they? What equipment will we need? From there, the costs will be determined on what we have to do. Contact us today and we can give you an idea about how much a tree health care plan will cost. Just because your trees are green and have leaves, that doesn’t mean they are healthy. In fact, they could silently be killing the rest of the plants in your yard. Unfortunately, your trees can’t tell you when something doesn’t feel right. Give us a call at (540) 886-5577 to get started.